TDD has become an essential practice for developers to have more confidence and engage practices such as refactoring. For example, if you updated some critical library in our application, you can run all tests to see if some implementation has been broken. 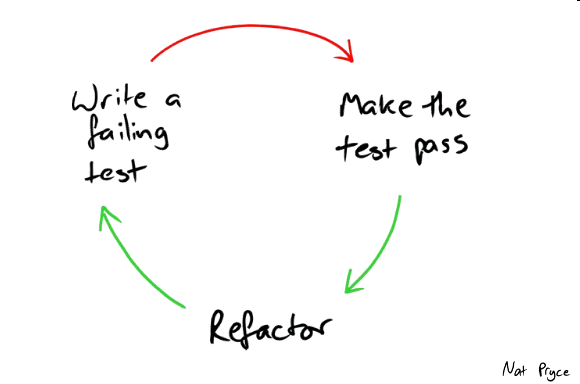 Test-driven development (TDD) is a software development process that relies on the repetition of a very short development cycle: first the developer writes an (initially failing) automated test case that defines a desired improvement or new function, then produces the minimum amount of code to pass that test, and finally refactors the new code to acceptable standards. Kent Beck, who is credited with having developed or ‘rediscovered’ the technique, stated in 2003 that TDD encourages simple designs and inspires confidence. Creating some concrete features, applying TDD. I will explain in-short, what you should know about TDD to put in practice. TDD has a concept called RED-GREEN-REFACTOR. Run the tests. The new one are going to fail. Write the code needed to match the test’s expectations. Run the tests. Now the newly written test should be passing. Refactor the code written to become more well written, abstract repetition, DRY it, etc. You will see that this cycle will performed several times. Let’s create the basic structure for our application. Before getting started, install Composer. Inside the root’s project folder, create the composer.json. Now, add at require-dev the phpunit dependency. Create the file phpunit.xml in root directory. PHPUnit need to know where our tests files are located and which configuration to use. The class definition above, is the way we should create our Test classes. We have to extend PHPUnit_Framework_TestCase to be able to use the set of tools that PHPUnit provides. Only the methods that have the test prefix will be called by PHPUnit. So the method testSomeThing() will be called. At this point, we have did the setup of our application with PHPUnit, now we can create something concrete. 1) `isValid`: Verifies the state of itself is valid. 2) `getPriceWithCurrency`: Renders the price with currency. Create the ProductTest.php at test’s folder. The first step is make a test to verify if the name attributes is really string. The error: Fatal error: Class 'Product' not found, was caused by non-existency Product class. Create the class Product inside src/ folder. Let’s run composer.phar dumpautoload to map all classes created. This errors was caused by the method isValid was not implementing the functionality to validate the name attribute. As you can see the testing was failing, and now we should implement the following code. Looking the ProductTest.php, you can note a little repetition in the code when you are testing the name attribute when is empty or a valid string, we can you can use a tool called DataProvider at PHPUnit. A Data Provider, is a tool to remove data duplication when are you testing some repetitive values. To use this feature you need create a public method inside test class, returning all possible values. The method’s name should be write in a comment on the function with @dataProvider. The values returned by the function will be passed as argument at the test. At the example above, PHPUnit will run the test case function 3 times passing the returned values. So far, we have created a validation of the name attribute, testing and refactor this method using @dataProvider tool. Running all tests, should be green. Now we will implement the next test case to price attributes, using @dataProvider. Now let’s implement to make pass this tests. Running the tests in terminal $ vendor\bin\phpunit all is green. Give confidences to refactor you code. Creates a layer to knows if was a regression of our code. If the feature is difficult to test, it’s can mean a bad code design. The process of TDD is something that you will incorporate in our day-to-day. I’ve heard people say: - “TDD is complicated, I not know how to start”. - “I don`t know how to use TDD with my framework X”. - First create a branch. - Start creating our first test. The same way you learn to code, coding, this is valid for learning tests, test something.